This bamboo edging is ideal for curved or straight borders. These bamboo garden edging can be used to retain raised flower beds. This bamboo edging roll is made from natural whole cane bamboo. These bamboo lawn edging is quick and easy to fit. Length: 1 metre (3' 3") x Height 0.15metre (6"). Length: 1 metre (3' 3") x Height 0.30 metre (12"). 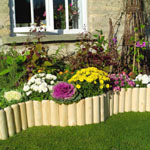 This bamboo edging is ideal straight borders. These bamboo garden edging can be used to retain raised flower beds. This bamboo edging roll is made from natural whole cane bamboo. These bamboo lawn edging is quick and easy to fit. *200mm height is when fixed into ground. 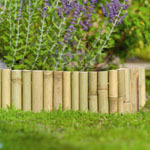 Prices for our willow hurdles and willow edging start at only £5.99 each. 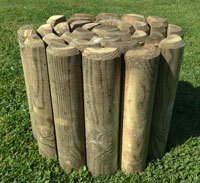 Please click on the image to see the full range of willow hurdle. Our wood edging is made from pressure treated timber for long life and prices start from only £5.99 each. Please click on the image to see the full range of wood garden edging..